Nickel silver, Maillechort, German silver, Argentan, new silver, nickel brass, albata, alpacca, is a copper alloy with nickel and often zinc. The usual formulation is 60% copper, 20% nickel and 20% zinc. Nickel silver is named due to its silvery appearance, but it contains no elemental silver unless plated. The name "German silver" refers to its development by 19th-century German metalworkers from the Chinese alloy known as paktong (白銅) (cupronickel). All modern, commercially important nickel silvers (such as those standardized under ASTM B122) contain significant amounts of zinc, and are sometimes considered a subset of brass. Nickel silver was first known and used in China. During the Qing dynasty, it was "smuggled into various parts of the East Indies", despite a government ban on the export of nickel silver. It became known in the West from imported wares called baitong (Mandarin) or paktong (Cantonese) (白銅, literally "white copper"), for which the silvery metal colour was used to imitate sterling silver. According to Berthold Laufer, it was identical to khar sini, one of the seven metals recognized by Jābir ibn Hayyān. In Europe, consequently, it was at first called paktong, which is about the way baitong is pronounced in the Cantonese dialect. The earliest European mention of paktong occurs in the year 1597. From then until the end of the eighteenth century there are references to it as having been exported from Canton to Europe. German imitations of paktong, however, began to appear from about 1750 onward. 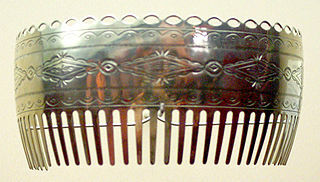 In 1770 the Suhl (Germany) metalworks were able to produce a similar alloy. In 1823 a German competition was held to perfect the production process: the goal was to develop an alloy that possessed the closest visual similarity to silver. The brothers Henniger in Berlin and Ernst August Geitner in Schneeberg independently achieved this goal. The manufacturer Berndorf named the trademark brand Alpacca, which became widely known in northern Europe for nickel silver. In 1830 the German process of manufacture was introduced into England, while exports of paktong from China gradually stopped. In 1832, a form of German silver was also developed in Birmingham, England. After the modern process for the production of electroplated nickel silver was patented by the Elkington brothers in Sheffield in 1840, the development of electroplating caused nickel silver to become widely used. It formed an ideal, strong and bright substrate for the plating process. It was also used unplated in applications such as cheaper grades of cutlery. Nickel silver first became popular as a base metal for silver-plated cutlery and other silverware, notably the electroplated wares called EPNS (electro-plated nickel silver). It is used in zippers, better-quality keys, costume jewelry, for making musical instruments (e.g., flutes, clarinets), and is preferred for the track in electrically powered model railway layouts, as its oxide is conductive. It is widely used in the production of coins (e.g. Portuguese escudo and the former GDR marks). Its industrial and technical uses include marine fittings and plumbing fixtures for its corrosion resistance, and heating coils for its high electrical resistance. In the nineteenth century, particularly after 1868, Plains Indian jewelers were able to easily acquire sheets of German silver. They used them to cut, stamp, and cold hammer a wide range of accessories and also horse gear. Continuing into the present, Plains metalsmiths have used German silver for pendants, pectorals, bracelets, armbands, hair plates, conchas (oval decorative plates for belts), earrings, belt buckles, necktie slides, stickpins, dush-tuhs, and tiaras. Nickel silver is the metal of choice among contemporary Kiowa and Pawnee metalsmiths in Oklahoma. Many of the metal fittings on modern higher-end equine harness and tack are of nickel silver. Musical instruments, including the flute, saxophone, trumpet, and French horn, can be made of nickel silver. Many professional-level French horns are entirely made of nickel silver. Some saxophone manufacturers, such as Keilwerth, offer saxophones made of nickel silver (Shadow model); these are far rarer than traditional lacquered brass saxophones. Student-level flutes and piccolos are also made of silver-plated nickel silver, although upper-level models are likely to use sterling silver. Nickel silver produes a bright and powerful sound quality; an additional benefit is that the metal is harder and has more corrosion resistance than brass. Because of its hardness, it is the most commonly used material for woodwind keys. Most clarinets, flutes, oboes and similar wind instruments have nickel silver keys, normally silver-plated. It is used to produce the tubes (called staples) onto which oboe reeds are tied. Many parts of brass instruments are made of nickel silver, such as tubes, braces or valve mechanism. Trombone slides of many manufacturers offer lightweight nickel silver (LT slide) option for faster slide action and weight balance. It was used in the construction of the National tricone resophonic guitar. The frets of guitar, mandolin, banjo, bass, and related string instruments are typically made of nickel silver. Nickel silver is sometimes used as ornamentation on the great highland bagpipe. Nickel silver is also used in art. 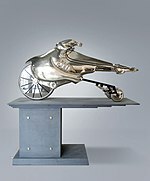 The Dutch sculptor Willem Lenssinck has made several objects in German silver. Outdoor art made from this material can easily stand against all kinds of weather influences. According to the Merck Manual, prolonged contact of copper alloys with acidic food or beverages (including boiling milk) can leach out the copper and cause toxicity. Long-term, low doses can lead to cirrhosis. It is also the case that many people have allergic reactions to nickel, causing a weeping rash that will not heal as long as the metal is in contact with the skin. ^ a b c Principles of Metallurgy. p. 62. ISBN 978-1-4400-5699-4. ^ Gayle, Margot; Look, David W; Waite, John G (April 1993). Metals in America's Historic Buildings: Uses and Preservation Treatments, Pt. 1, A Historical Survey of Metals, Pt. 2, Deterioration and Methods of Preserving Metals. p. 35. ISBN 978-0-16-061655-6. ^ Marks of Berndorf Metalware Factory in Austria - Marks of Alpacca and Alpacca-Silver II Products: an article for ASCAS - Association of Small Collectors of Antique Silver website. Ascasonline.org. Retrieved on 2013-12-19. ^ Samuel J. Rosenberg. Nickel and its alloys. Monograph ; 106. National Bureau of Standards. p. 8.6. ^ Nickel Silver - retrieved 19 April 2010. ^ Holmyard, E. J. (1957). Alchemy, p. 80. New York: Dover. ^ a b c Derk Bodde, "China's Gifts to the West". Columbia University. ^ Neumann, Bernhard (1904). Die Metalle: Geschichte, Vorkommen und Gewinnung, nebst ausführlicher Produktions- und Preis-Statistik. Vom "Verein zur Beförderung des Gewerbefleisses" preisgekrönte Arbeit. p. 327. ^ Neumann, B. (1903). "Die Anfänge der Argentan- (Neusilber)-Industrie und der technischen Nickelerzeugung". Zeitschrift für Angewandte Chemie. 16: 225. doi:10.1002/ange.19030161004. ^ Dubin, Lois Sherr. North American Indian Jewelry and Adornment: From Prehistory to the Present. New York: Harry N. Abrams, 1999. ISBN 0-8109-3689-5., p. 290-293. ^ Quantz505 - Pearl Flute Worldwide Archived 7 February 2012 at the Wayback Machine. Pearlflute.com. Retrieved on 2013-12-19. ^ Elegante - Pearl Flute Worldwide Archived 7 February 2012 at the Wayback Machine. Pearlflute.com. Retrieved on 2013-12-19. ^ Bach > Professional Bb Tenor Trombones > Viewing Model LT16M Archived 16 October 2011 at the Wayback Machine. Bachbrass.com. Retrieved on 2013-12-19. Wikisource has the text of the 1911 Encyclopædia Britannica article German Silver. "German Silver" . The American Cyclopædia. 1879. This page was last edited on 28 November 2018, at 05:17 (UTC).